Web Push Notifications become quite popular in recent years. Every third website offers you push notification option to keep you posted about their updates. Nowadays web push notification services are high in demand and quite a number of good options are available in the market. Push Notifications help you to get more visitors and click-through-rate of these notifications are better than email marketing. I always recommend my clients to use the same. But which one is the best? And how easy their implementations are? In this article, I will discuss, What is Web Push Notification? How does it Work? How web-push-notifications help to Drive Traffic to your site? What are the Best Free WordPress Web Push Notifications Plugins available? And How to Setup Free WordPress Web Push Notifications? You may have noticed pop up messages in the form of emails, and icons or brand logos on your devices. These are called Web Push Notifications, which is based on the Push Technology or Server Push. These are messages coming from another websites or web apps. They reach your device even when you’re not on the same site where they occur. Sometimes, they are delivered to your laptop even when the website is not open in your browser. Apparently, they are submitted to your device through a subscription to the site. These messages delivery happens even when your email is not known. This concept of message receipt is the push process. Web Push Notification is, therefore, intended to reach you wherever you are and are mainly intended to market sites and products which are offering the web-push. Google also recommends the use of Web Push Notifications under their Web Fundamentals section. When you visit a website, you might have noticed a pop-up message appears stating that www.example.com (website’s name) wants to send you notifications with two or more options to opt from: allow and don’t allow or later. If you choose to allow by clicking on it, that means you have subscribed for push notifications from that site. Once the visitor subscribes to the push message service of the site, the site owner or webmaster can send push notifications the subscriber. Encouraging and inspiring you, getting you excited about something such as a recently unveiled offer at a store down the block. Or helping you pick up from where you left. Why is Push Notifications Important to Drive Traffic? If you are a blogger who updates their blog on regular basis. These Web Push Notifications can do wonder to increase traffic to your site. Subscribing to a Web Push Notification is quick and easy. Because many visitors are easily attracted to the web-push subscription. As a recent survey conducted by industry experts concluded that Push Notification Plugins have around 50% conversion rate. Another key reason why Notification are useful (from publishers’ standpoint), is the possibility to interact with the viewers immediately. This is apt since users decide on the spot, whether they want your notification update or not. Web Push Notification is quite handy when it comes to engaging your mobile audience without having your app. There are high Opt-in and conversation using web-push, moreover, you can send personalized notifications to your subscribers (Push Notification Subscribers). There are many Free WordPress Web Push Notifications Plugin available on the market. I have tested more than ten plugins on my several web projects. And here I am sharing the seven Best Free Web Push Notifications Plugins for WordPress. The list of plugins below is not in any specific order, however, I am going to recommend my favorite Push Notification Plugin along with the setup detail. Read on for the details. Pushed is an autonomous push notification service. It allows you design your app for pushing notifications of your site. The WordPress then takes charge, enabling your blogs to reach your audience. Pushed WordPress implementation is easy, you can automate your notifications and it will send the notification to your push subscribers as soon as you published a new post or updated a new article. By creating a new app via the Pushed platform, you can reach your target by sending messages incorporating a QR code as well. It works well with Android and iOS platforms along with Desktop browsers such as Chrome, Firefox, and Safari. Push Monkey is one of the most popular Web Push Notification services. This works well when you need to push messages to your client’s desktop. By sending a one-liner request for subscription to your target, Push monkey will broadcast your messages to all who have accepted the invitation. Push Monkey offers a variety of plans. Starting from 100 Free subscribers and $16 per month for 2K subscribers. It also offers seamless integration with almost all the popular platforms like desktops browsers (Chrome, Firefox, and Safari) and mobile platforms (Android and iOS). Proximi is another WordPress Notification Plugin compatible with all Android, Chrome and Safari browsers. By facilitating your collection of geography-specific details, this plugin offers you another benefit of location data analysis. Hence you can send region-specific messages. The solicitation is attractive too, with an option to include your company logo with the notes. This real-time plugin allows for immediate push message transfer from your WordPress site to any device with iOS, Android, Safari, Chrome, and Firefox. Delite Studio provides an alert to any new release, including newsletter, sporting results, weather and traffic conditions. 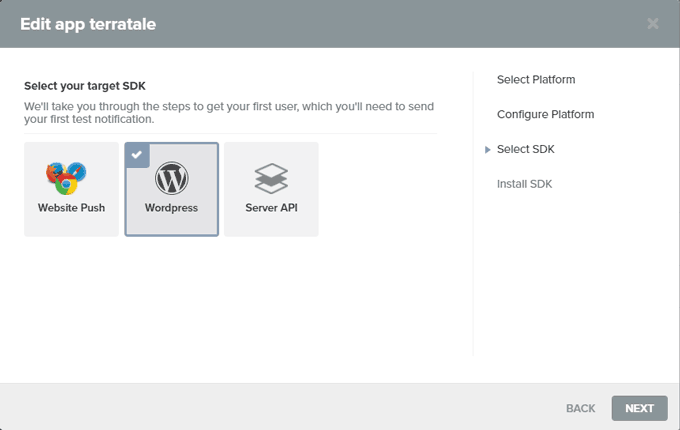 Also, Delite Studio – Push Notification for WordPress (Lite) allows for the construction of attractive apps. It sent notifications straight from your WordPress site and does not use any third party server, the service is totally free and very easy to implement. You just need to install the plugin and do a basic setup. OneSignal perhaps the most acclaimed of all the Free WordPress Web Push Notifications plugins. It supports major browsers such as Safari, Firefox, and Chrome. Once a visitor signs up, you can utilize its features such as targeted messages to engage them. You can access the OneSignal – Free Web Push Notifications service comes for FREE with no limitation on the number of devices, notifications and push messages etc. Next Push Notification service on the list is PushCrew. This service is quite popular with most of the big internet brands out there. It comes with a free plan for first 2000 subscribers and after that you can opt-out an $18 per month plan for unlimited notifications. PushCrew WordPress Plugin is very easy to setup. You only need to install the plugin and enter your PushCrew accounts details. The plugin automatically integrates the web notification code in your WordPress site and start working. Pushify, the last Web Push Notification Service on the list, but definitely not the least. Pushify packs some great features under the hood. Apart from popular desktop web browsers, it also sends push notifications to the register mobile numbers. Pushify is proud to be the 1st mobile number based push notification system in the world. The service can be implemented with any WordPress site effortlessly. All you need to create an account on their portal. Download and install Pushify WordPress plugin from the WordPress plugin repository for free. Enter your Account Key and Subdomain URL (provided by Pushify). That’s it. It will start showing a pop-up to your visitors to subscribe to Web Push Notifications. Hope you find the list of most popular push notification services useful. These basic details of Best WordPress Web Push Notifications Services will certainly give you an idea about which one to explore further to implement on your site. However, if you are still not sure which plugin you should use on your WordPress. Don’t worry, I have a recommendation. I would recommend you to use OneSignal – Free Web Push Notifications, this is a great notification service which comes with tons of features, and moreover, it is absolutely free. I also use the same on my other web projects. Let’s get into the details and learn how to setup OneSignal Free WordPress Web Push Notifications Plugin. The second recommended plugin would be SendPulse. Though, I have not included that in this list because SendPulse is more than a WordPress Web Push Notifications service. It includes email opt-in, notifications, targeted sms messages and much more. Read our full review of SendPulse. First of all, let’s explore the OneSignal features and then we’ll learn how to integrate OneSignal in WordPress site. 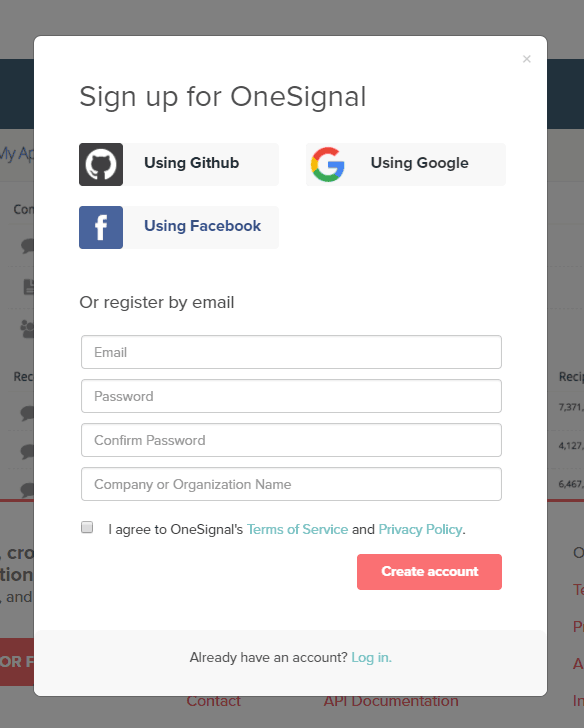 You must be thinking that what makes OneSignal so accessible and popular? In one line, I would say, it is its ability to gauge visitors’ interests in specific topics and grade their preferences. It is 100% free to use, you will be able to send unlimited notifications to the unlimited devices. This versatile and complete push notification plugin for WordPress is compatible with both desktop and smartphones. After setup, it facilitates your visitors get custom opt-in process, and delivers notifications at scheduled intervals. This is one of the key features of this plugin. It supports all the major browsers and both HTTP & HTTPS sites. It’s applicable for desktops and mobile devices using chrome, Mac devices using safari and desktops using Firefox browsers. Provides automated notification with each instance, when there is a new development or fresh post. It also sends reminders to “dormant” visitors after a couple of days. Targeting specific segments for niche blog or posts is also a great feature of this WordPress Web Push Notifications Plugin. Using geography and language, it allows particular user attributes when broadcasting messages. OneSignal schedules, how you want your visitors opt-in to browser messages and allows for customization of the notifications. A/B Testing Function availed by this Notification Plugin facilitates your sampling results before engaging in a full-throttle campaign. A/B testing allows you to create an effective and targeted sales promotion exercise. You can also get real-time analytics by following how your visitors convert to leads and sales. 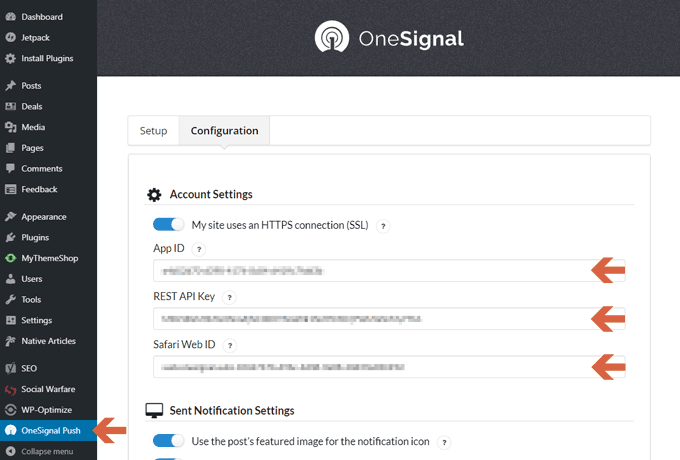 OneSignal possesses a useful WordPress Notification scheduling feature. You can tell how and when same visitors log onto your posts, providing you with better presentation and delivery of notifications. 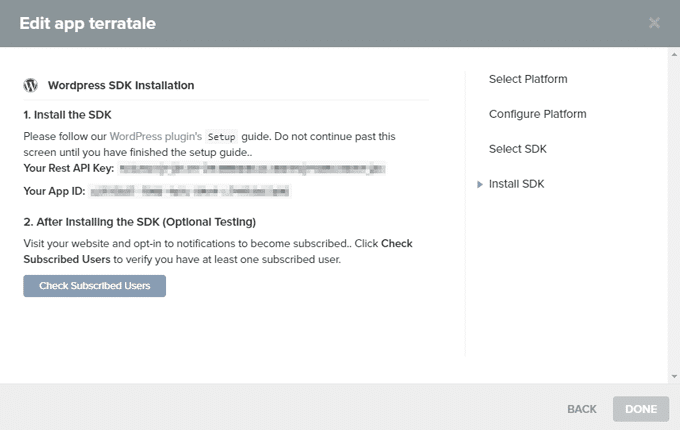 The process to setup the OneSignal Free WordPress Push Notification plugin is quite easy. You only need to follow few given steps for the same. First, login to your self-hosted WordPress blog and go to the Add plugin page. Next, search for OneSignal plugin using plugin search, install the same and activate it. Now, head over to OneSignal website and create your free OneSignal account. You can Sign Up using your Google/Facebook or Github account. After Sign Up, the portal will facilitate you to Create your First App. Click on the Add a new app. An inbuilt popup window will appear. Enter your App Name, I usually use website name as App Name. Then click on ‘Create’ button. 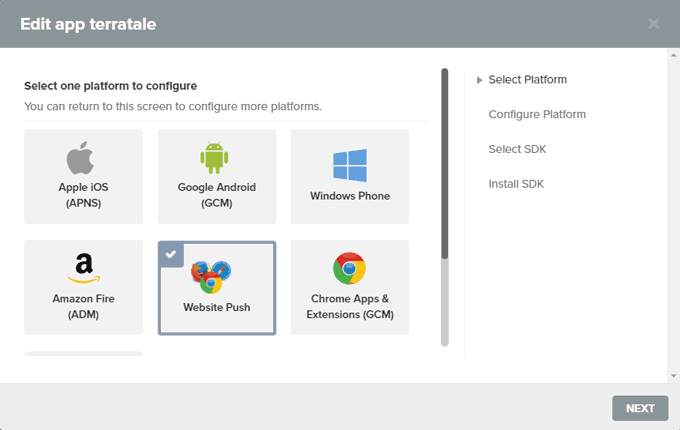 Next step is to Select the platform “Website Push” for the configuration. Then click on ‘Next’ button. Choose Google Chrome and Firefox for setup. Safari Setup will do in further steps. Then click on ‘Next’ button. 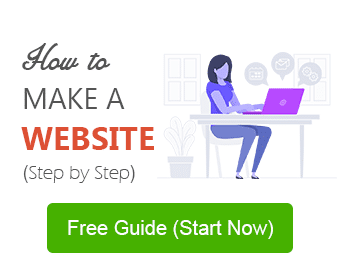 Enter your Site URL (i.e. https://terratale.com) as displayed in the figure. Make sure that you have entered the exact protocol you are using i.e. https:// or https://. Then enter your Site Icon URL (i.e. https://terratale.com/wp-uploads/images/tt-logo.png), you can upload a logo image (logo size should be at least 192×192 pixels) on your WordPress site and use the link of the same, like I did. Or you can leave it blank, in that case, the OneSignal logo will be used by default. Then click on ‘Save’ button. 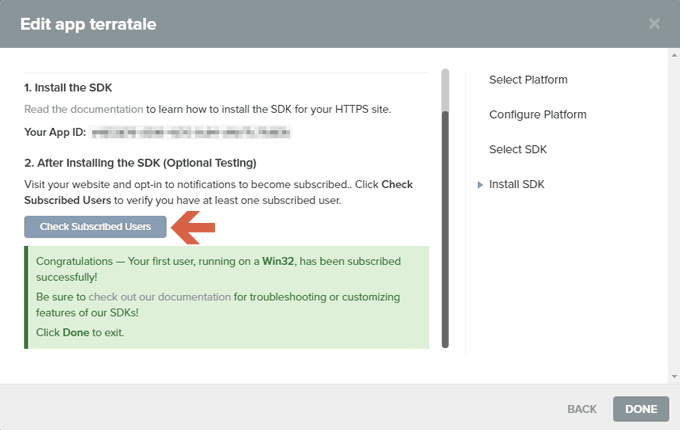 Now, you need to Select your target SDK, here select the WordPress SDK and then click on ‘Next’ button. On the Next screen, The OneSignal portal will create your App ID and Rest API Key. Copy the same and switch over to your WordPress Dashboard. Next step is, Navigate to your WordPress Dashboard > OneSignal Push. Enter your App ID, REST API Key in the Account Settings section, as shown in the figure. Now, scroll down for more settings such as, Sent Notification Settings, Prompt Settings & Notify Button, HTTP Permission Request Settings, Popup Settings, Welcome Notification Settings and other advanced settings. I would suggest you leave it as default for the initial setup. You can change these settings later. Then click on ‘Save’ button. Now, open your website in a new tab. You will find a notification icon in the bottom-right corner of your browser window (as shown in the figure). Then, Click on the notification icon and a pop-up message will appear “Will you allow terratale.com to send notifications” (as shown in the figure). Click on the ‘Allow Notifications’ button. A confirmation notification pop-up will appear as per the given image. You can change the ‘text’ of this pop-up via OneSignal configuration page on your WordPress dashboard. Similarly, you can setup Web Push Notifications for Safari. 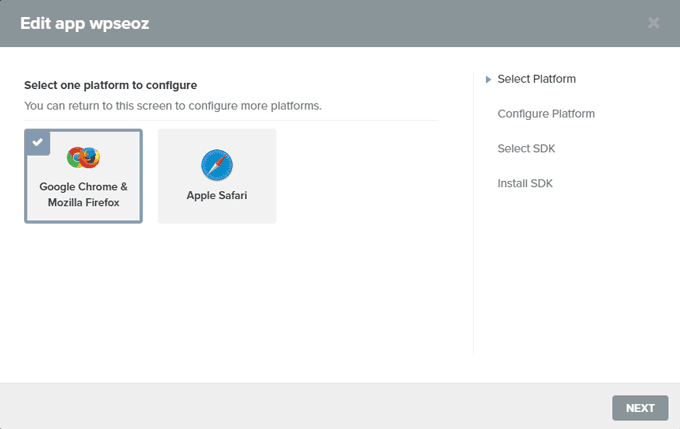 Go to your OneSignal portal Dashboard > App Settings > Apple Safari > Configure. Follow the steps, Enter Site Name and URL. Then click on ‘Save’ button. It will redirect you to the main dashboard and you will find your Safari Web ID as per the given image. Copy Safari Web ID and Paste it into WordPress Dashboard > OneSignal Push > Account Settings > Safari Web ID, also shown in Step 8 figure. That’s it. You have Successfully Setup Web Push Notification on your WordPress Site. There are a couple of interesting features you will find on OneSignal Dashboard. I am going to share few screenshots of the same, it will help you to configure A/B Testing and Automated messages. 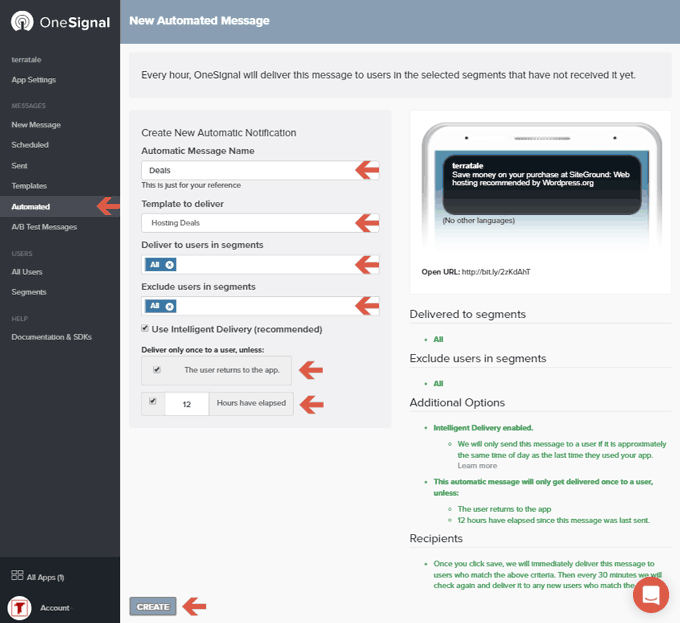 In order to send a message or to create A/B Test, first, you need to create a message template on OneSignal Dashboard as shown in the figure. Setting up your first Automated message is quite simple, go thorugh the instructions are shown in the figure. 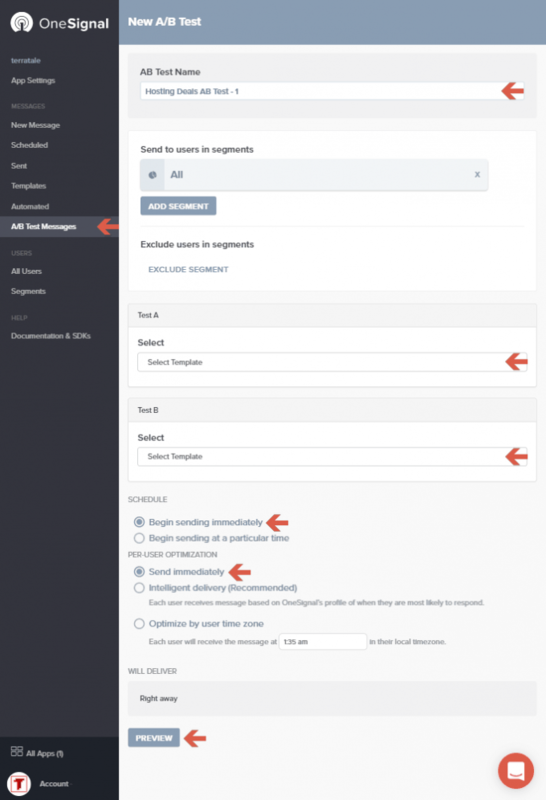 You can Setup A/B test message, to know which type of message works well and which notification campaign needs improvement, follow the instructions below. It would recommend you to give OneSignal a try before trying any other Free WordPress Web Push Notifications Plugin. As it is free and loaded with tons of features, I am sure you will enjoy using OneSignal. However, if you are looking for other options due to any reason, I would suggest you go with Delite Studio Web Push Notifications for WordPress (Lite). This plugin is also free and comes with basic yet powerful features under the hood. Hope you have found this article helpful. Do let me know, which Web Push Notification plugin you are using, via the comments section below. Did you find any difficulty to complete your Setup for Free WordPress Web Push Notifications, fire away your quires, I would be happy to help. This is a great article for me. i thinks it will helpful to other people too. Thank You for your sharing. I have setup OneSignal as per your instructions, and it is working great. Thank you for this wonderful post. Helped me a lot.